Cost to Add a New Owner-Built Bathroom - Armchair Builder :: Blog :: Build, renovate, & repair your own home. Save money as an owner builder.- Armchair Builder :: Blog :: Build, renovate, & repair your own home. Save money as an owner builder. I’m in the process of converting a closet into a full bathroom for a customer. The question I get on a daily basis about virtually all possible new home projects is… “How much would this cost?” Because remodeling is so dependent on your existing conditions I first like to meet with the mechanical trades to determine what is involved and the cost. How much drywall will need to be cut? Will a one piece shower unit fit up the stairs or will we need a 3 piece unit. Will everything fit within existing framing or will we need to adjust walls? If we need to adjust the walls, what other wiring, plumbing or ductwork is in the way? How will we get the plumbing down to the main stack? Will the existing floor framing support the new tub? In my case, all I needed to do was move one wall 6″. So we needed to adjust the wiring in the wall and patch carpet from where the wall was moved. We are adding the bathroom to a closet on the second floor of a home with a basement. So, we needed to cut a few holes in the ceiling of the first floor to run the plumbing. So, when we start talking about costs it’s necessary to clarify the specifications (i.e. types of finishes) in order to totally understand the details. For example, if I were to compare the extremes of kitchens I have built, I would tell you the cabinets in the most expensive job cost more than the entire kitchen remodel on the least expensive job. So, the type of finishes can affect project cost in a big way. 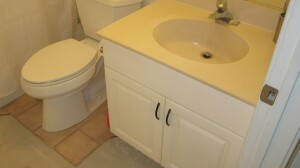 The bath addition I am finishing up is a low cost third bath for an expanding family. Our specifications are as follows: 5′ by 10′ bathroom, standard size production vanity (30″), standard size cultured marble top with integral sink, builder grade vinyl flooring, sheet mirror, fiberglass three piece tub/shower surround, vented fan per code, builder grade light fixture and faucets, painted colonist trim (we will use the existing door from the closet). My total cost to add this new bath into an existing home = $5422. Keep in mind, the homeowner did all the demolition and painting themselves to save money. Is there any other skill that you have that could further reduce the cost? In addition, you would also have some costs associated with the permit and inspection process. Check with your local building department to determine these. Thanks for the comment Geri. Good luck with your building project! Gosh, I wish I would have had that inforamiton earlier! One of our guests just lately advised the following website….